one of Hertfordshire's most beautiful and well-kept villages. Cottered and Throcking Parish Council received sufficient valid nominations to require a poll to be held. The persons who stand validly nominated for the election are shown via this link - Statement of Persons Nominated. The poll will take place on Thursday 2nd May 2019 and a Notice of Poll and Situation of Polling Stations will be provided in due course. recommendations of the Community Governance Review of Buntingford Town Council, including the town boundary. This was the subject of public consultation from 13 February 2018 until 6 April 2018 and again from 31 May 2018 until 27 July 2018. 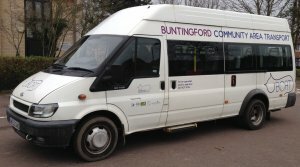 The Council agreed the final recommendations of the review, including changes to the parish boundary between Buntingford and Cottered with effect from 1 April 2019. The Reorganisation Order giving effect to these changes has now been sealed. Hard copies of the decision document and Reorganisation Order, and of maps showing the details of the boundary changes are on deposit and available for public inspection during office hours at the East Herts Council offices at Wallfields in Hertford and Charringtons in Bishop’s Stortford. Coming to Cottered and Throcking EVERY MONDAY Starting on 1st October 2018. Please click on the links for a guide to times and pick up points. Cottered and Throcking Parish Council's Privacy Notice and ICO Registration Certificate. The Parish Council has received a copy of the report investigating the feasibility of placing a pedestrian crossing on the A507 in Cottered..
An update on the New Homes Bonus is available via this link. East Herts Safety Advisory Group (SAG) would like to know if you are organising an event as they can provide a one stop shop providing advice on running a safe and successful event. Click on the link for further information. Meetings are normally held bi-monthly on the 2nd Tuesday of the month starting at 7.30pm in Cottered Village Hall. Cottered and Throcking Parish Council is required to make public certain information in order to comply with the Transparency Code for Smaller Authorities. Cottered & Throcking Parish Council has six Parish Councillors.